Aluminum tops and bases for reduced weight. Half the weight of other filters. 46mm (1.8") RC-48 activated, certified virgin carbon bed. Machine packed carbon means more carbon and less movement. Cone shaped internal base for optimum air flow. Sealed, bagged, boxed and labeled directly after being manufactured for optimum life span, handling and presentation. 51% open air custom mesh. Unique "Anti Air Bypass" System. 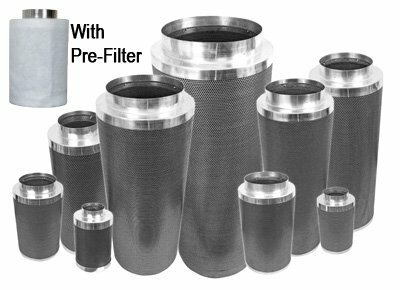 Flange & pre-filter included.